1. 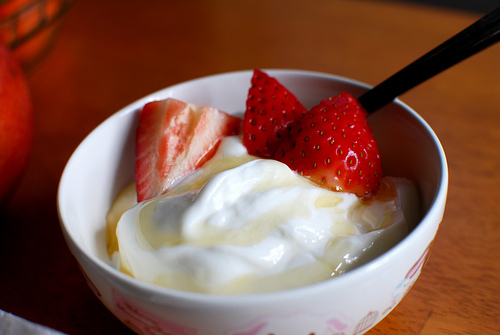 Combine 2 tablespoons of plain yogurt with 2 tablespoons of honey, and pulse with a blender until mixed evenly. 2. Add 1/4 cup mixed berries and puree until smooth, add 1 tablespoon lemon juice and mix until the ingredients are evenly combined. 3. Using your hands, slather this hydrating face smoothie all over your clean, dry face. Grab a book and let the mask sit 10 to 15 minutes. 4. Rinse your face thoroughly with warm water and pat dry. This all-natural recipe is safe from chemicals, nourishing for the skin and deliciously delightful for the summer months! These mother nature inspired ingredients help brighten and care for the skin by delivering a healthy dose of antioxidants through the berries, by the way, blackberries deliver even more antioxidants than blueberries. For extra brightening, lemon juice provides fortifying vitamin C and natural enzymes with a fresh citrus scent. Yogurt is a great hydrator that will moisturize your beach ravaged skin while the honey is a mild antiseptic that gently exfoliates, promotes tissue growth, and seals in moisture. Voila, gorgeous skin at the height of summer!